This is from the fourteenth and fifteenth parts of the handbook, starting to look at where the materials used for making our clothes come from and how they are processed to achieve the forms to be used by the tailor. Obviously from before the days before nylon and other man made fibres, but don’t miss the part about asbestos! Some parts have been summarised as the information is available elsewhere on the web. In a former article I told you clothing was made from the products of the mineral kingdom, the vegetable kingdom, and the animal kingdom. I now want to direct your attention to each of these in turn. If you go to the Tower of London you will there see some wonderful suits of mail, made in all sorts of patterns, and many of them beautifully decorated. Some of these bear the marks of the battles through which they have passed and give evidence of the splendid protection they afforded heir wearers. The days of armour and coats of mail are passed, but we still use minerals in our clothing. In their solid state. Picture to yourself a military review, and try to decide how very much of the clothing is of mineral origin. There will be the buttons, laces, ornaments, etc., made from gold, silver, brass, iron and many other substances, and this is but an illustration of what is taking place on every hand. True, the trimmings may not be so bright; but that simply means the exchange of one metal for another. It is not often nowadays that gentlemen adorn their clothes with precious stones , but when you go to the Tower and see the Crown Jewels you will find that most of the precious stones have been used for purposes of clothing, and a history of the famous diamonds, pearls, rubies, reveals to us that whatever practical value they may have in other ways they have been invariably used for purposes of dress; history tells us that jewels and precious stones were at one time as freely used for the decoration of men’s garments as they now are for ladies. Gold is the only metal that in its pure state is yellow. It is soft and very tenacious, so that it can be beaten into leaves so thin that a quarter of a million of them would only measure one inch. It is found in dust, nuggets, and quartz in various parts of the world, such places, for instance, as Klondyke, California, the Transvaal, and Australia. It is largely used for fringes, laces, button, etc. Silver is a white metal, harder than gold, but softer than copper. It has a soft, rich effect when made up into lace, etc. it has a soft, rich effect when made into lace, etc. it is obtained from mines in Norway, Sweden, Mexico, and various other parts, but it is not found in workable quantities in England. German silver is a name given to a mixture of copper, zinc, and nickel, and is largely used for electro-plating purposes. Iron, which is freely used for buttons, etc., is found in the form of ore in many parts of the world, and is of a dull grey colour. It is very hard, and is an excellent conductor of electricity and heat. It melts in fire and rusts in water, so that if there are any iron buttons on a garment they should be removed before it is sent to wash. Steel is iron mixed with carbon, which renders it very hard and brittle. Cut steel buttons are very pretty, and the usefulness of steel for scissors, needles, etc., is well known. Fringe, springs, bands, and many other things are made from it. Tin comes mostly from mines in Cornwall, and is of a silvery, white colour, and is very hard. It is very useful for covering iron and steel, as these are thereby prevented from rusting. Thus many of the white brace buttons are made. Lead, used for weights, comes to us from mines in various parts, the most famous being those in Cumberland and Westmorland, it is very heavy, of a bluish-grey colour, and is very soft. It has a very bright surface when freshly cut, but this soon wears off after exposure to the air. Zinc is a metal used for many purposes. It is hard, light in weight, brittle, and of a bluish-white colour, and when polished is very bright. Zinc ore are found in many English counties, as well as in most of the continental countries. Copper is of a light red, salmon colour, very elastic and tenacious; it can be made into very fine wire or sheets. We get it from the mines in Cornwall and other counties, as well as from abroad. Bronze is a mixture of copper and tin; brass is a mixture of coper and zinc, and pewter is a combination of tin and lead, all of which are freely used for various purposes of clothing, but you must hunt the special features of these for yourselves. There are many very interesting books on the subject, and if you care to send to Messrs. Cox and Co. of 99 Oxford Street, London, W., they publish two cards on this subject at one penny each, or you can order them through any bookseller. (Please don’t send off for these as Messrs Cox and Co are no longer at that address!) Their titles are: “Metals, their Sources and Uses,” Parts I and II. They also publish similar cards on precious stones and jewels, to which you must refer for information on that topic. 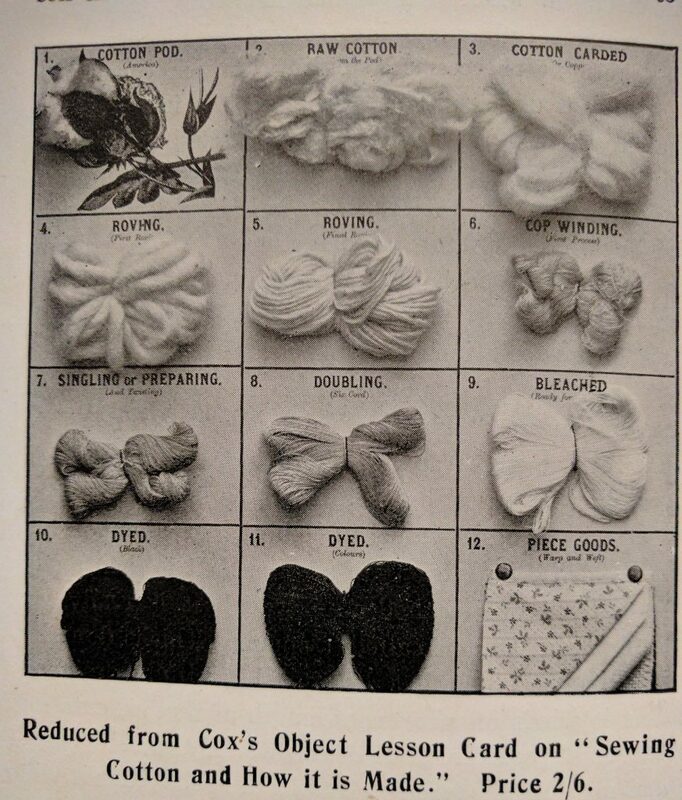 There is one remarkable mineral used for clothing that I have not mentioned, viz., asbestos, or as it also called “amianthus.” The peculiarity of this material is that it is incombustible. The best kind comes from Corsica, and formerly it was woven into articles of clothing, which when dirty, were thrown into the fire, from whence they came out perfectly clean. When the ancients burned their dead, they tied them up in this cloth to preserve their bones. It is used in many other ways today, and is certainly an object of mush interest. At this point I should remind the reader that WDF’s original article was written long before the ill effects of asbestos were known. You should not attempt to recreate such clothing without first seeking professional and expert advice. Al-Tabari talks of the Persians having napkins made of asbestos that were cleaned in the fire. 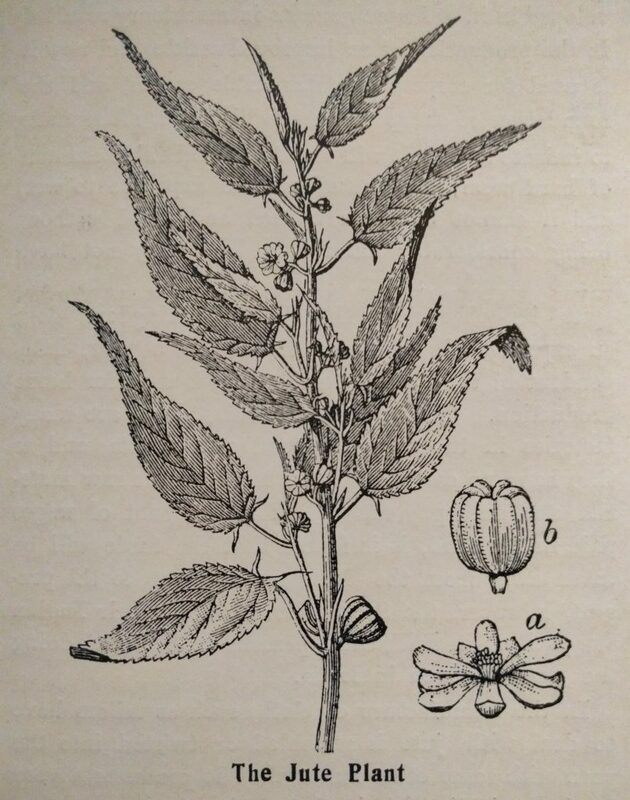 Of the many vegetable products used for the manufacture of materials for clothing purposes , there are three which are specially cultivated for this purpose, viz., cotton, linen and jute, whilst to these must be added various substances used for dyeing, finishing, etc. … Now that is a long story, and you may well be surprised that despite all the processes through which the cotton has passed, and tye many thousands of miles the cotton has been bought, you are able to obtain it for the low price of a few pence; such are the benefits of organised labour, and time saving machinery. The next vegetable product to claim our attention is linen, a material which has been used from the earliest ages of which we have any history. References are made to it in Genesis, Exodus, and Job, as well as in the poems of antiquity, and illustrations of the various methods of manufacturing it are to be found on the walls of the tombs and temples that were erected in the days of early Egyptian history, probably 4,000 years ago. The material that can supply the wants of the ancient Egyptians and the modern Englishman must have considerable merit, so I feel sure that a brief survey of the various processes through which the raw material passes will be full of interest. WDF takes us through the physiology of the flax plant and describes how it is harvested and prepared and the resulting “Rove” is ready for use to make thread. As there are plenty of resources elsewhere on the web which describe these processes, I am not including all of th text from the book here. WDF also tells us about the seed of the plant, which is known as linseed: …and if you are ill with a cold on your chest, a poultice made from linseed meal will do much to cure you, whilst tea made linseed will prove very gratifying as a drink. I am not in a position to confirm the medical benefits! The flax rove is now handed to the spinner, where the slight twist of the rove is increased until it gets thinner and thinner, and begins to assume the appearance of thread, but as yet it is only yarn. This is generally done under moisture as the flax fibres will not adhere to each other dry. The wet spun yarn is then “reeled” in 300 yard lengths. Te of these constitute a “hank”, which contains 3,000 yards, and twenty of these make a bundle which contains 60,000 yards. It is then dried and made up into bundles or bunches. This is doubled and trebled, and again twisted until we get a thread ranging in thickness according to the number of cords and the coarseness of the flax used. The revolutions of some of the spindles for these purposes number no less than 6,000 per minute. Up to this period it is of a light drab colour, and it now has to be treated in a different manner, according to the colour it is desired to be. If white is wanted, then it has to be bleached, and if you want to investigate this process you will find yourself in a sloppy, steaming shed, amongst troughs, tanks, and tiers, in which boiling and dipping, washing and straining are going on, as well chemical treatment, etc.,. If black is required, then it has to be dyed, and after this it is polished or glazed. The follows the tying up into skeins and hanks, or if it intended for machine use it is put on spools or reels in much the same way as the cotton, after which it is labelled and boxed and sent out to the trade. The skein thread which you use for sewing is packed in 2lb. bundles, and the machine thread is put up in 2oz, reels and 1lb. boxes. You, of course,know that thread is much more expensive than cotton, but it is very much stronger and the best material for sewing purposes when joining seams upon which there will be some heavy strain. Now, just as the cotton was converted into calico by weaving the warp or length-ways thread and the warp (there appears to be a typo in the book here – it should say Weft!) or crossways threads together, so the linen yarn is transformed into a piece of linen, the threads are inetrwoven aand made to cross each other at right angles in the pattern you are so familiar with in a piece of linen or canvas. The weft or crossways thread is always softer and less hardly twisted than the warp, which is the thread that runs through the entire length. The warp is also sized before it is woven so as to facilitate the working. Take up a piece of either of these materials and examine it, and you will see how much depends on the kind of thread used, and the fineness or coarseness of the weave. The variety of materials and designs made from flax fibre is marvellous, and the very clever way perforated cards are used in the looms is very wonderful, but this i cannot stay to describe, suffice it to say that each hole represents one throw of a shuttle, and in some very intricate patterns it is necessary to have 50,000 cards to weave 6 1/2 yds. of damask. When the linen is woven it is bleached, beetled, calendared, and mangled, according to the finish desired. These processes are very similar to the treatment of the cotton goods. Then it is examined and measured by hand, or it may be measured and folded on a machine, which registers the length on a dial in a very clever way, and it is then ready to be sent out. I daresay you know by this time what an important part the dandy canvas plays is building a coat, and how necessary it is to have proper linen stays to the pockets, button holes, etc., that many of the best results in tailoring are to be obtained by its use. 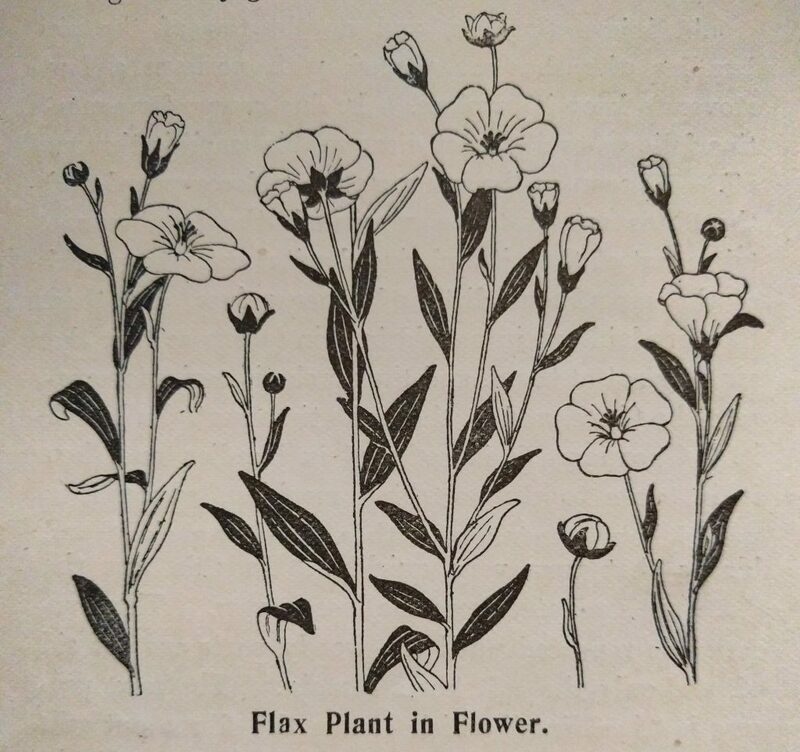 Then you will do well to think of the many garments made from linen for wear, both in this country as well as the more tropical parts, and by that time I have no doubt you will realise the importance of the little flax plant. If you examine linen and cotton under a powerful microscope you will see how much smoother the former is, and whilst the cotton has any number of little ends or fibres all over the surface the linen is almost free from them. Another difference between the two substances is that I have already referred to, viz,. 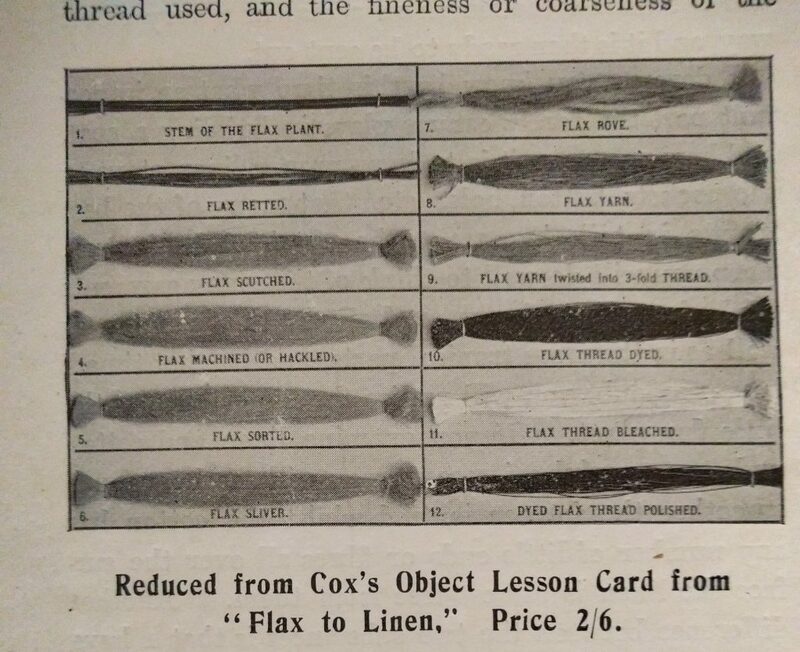 that flax is practically non-stretching, whereas cotton will give considerably. The information I have here given you has been in a lrage measure supplied to me by the well-known firm of Henry Bannerman and Sons, of Stalybridge, Ancoats, Dukinfield, Manchester, London, etc. I many of the commoner makes of cloth there is a substitute used for linen which is known by the name of Jute. This material is obtained from the bark of two kinds of plants of the lime-tree order, so that whilst we get cotton from the seed pod and linen from the stalk, this comes quite a different part of the plant, viz., the bark. Again WDF takes us through the physiology of the plant and how it is processed to produce fibre which can be prepared for spinning, …and then the heckling and roving processes are followed as was described for linen. In the manufacture of cloth, such as tailors have to deal with, jute is scribbled or twisted into the yarn with some other material. It produces a very hard, unyielding cloth, though it often presents a good appearance. Used in connection with dyeing and finishing cloth, but I will not weary you with a description of all of these, as we should have to trace them through various intricate processes. Thus we have wood used to make buttons, whilst there is a substance known as vegetable ivory that is also used for buttons, which is capable of receiving a very high polish, and wears wonderfully well. This substance is taken from the coagulated milk of the seeds of a very fine palm tree that grows on the River Magdelene, in South America. It is brought to this country as ballast and was formerly thrown away. It is a hard, round substance, not quite so large as a cricket ball, and is not unlike the inside of a cocoanut. I also have an impression that a button manufacturer told me that some ivory buttons were made from the inside of potatoes after they had been treated to hydraulic pressure, but I have not been able to verify this, so you will be safer in acknowledging the former definition of vegetable ivory, viz., that which is obtained from the coagulated milk of the palm tree. These items will suffice to give you a good idea of the many ways we use the products of the vegetable kingdom, and I trust that when you take your walks around and admire the beauty of the fields and the flowers you will realise that these have not been called into existence simply to decorate the earth, but they also have a practical mission. Part two of this article will look at animal products used for clothing, and give advice on dealing with moths.